The Kenmore Community Club has hosted numerous functions including this 1951 Christmas party. Bob Smeltzer plays Santa Claus and Bonnie Smeltzer, his wife, is behind him as Mrs. Claus. Standing in front with his back to the camera is Bob Millman. 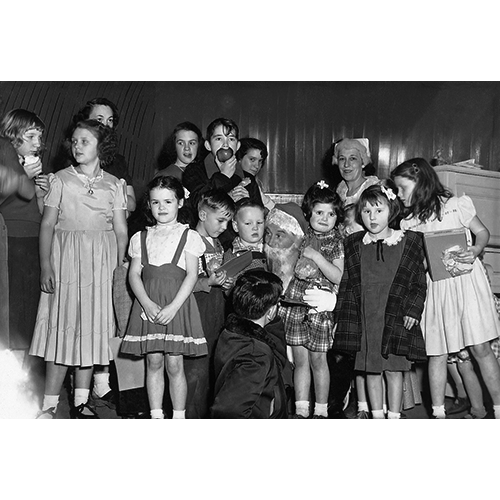 Front row, left to right, are Barbara Kramer, Rosalie Wentzel, Linda Foss, unknown boy, unknown boy, Santa, unknown girl, Wilma Wentzel, unknown girl holding book. Back row, left to right, Trula Jane Foss (partially hidden), Carol Foss, Tom MacRae eating apple, and Virginia Menard behind Tom. Photo courtesy of Ed Millman.